The Pakka Jacks system has revolutionized machine maintenance on mine sites across Australia, for a wide range of machines and procedures. This patented system has been developed and tested for over a decade, in some of the harshest mining conditions in the world. We have successfully completed projects on over 80% of all major open-cut machines in Australia. In that time, the system has established itself as vastly superior in terms of safety, speed and cost-effectiveness. It has completely changed machine maintenance for some of the world’s largest mine site operators. To get the same advantages on your site, talk to us. The digger slew bearing surfaces required a laser survey to assess potential damage, before the bearing was replaced. The digger was split and the old bearing removed 14 hours after the team arrived on site. The laser survey was conducted, revealing that the lower bearing surface was 0.022 inch out of specification, and required reclaiming. A specialist machinist company was promptly contacted and the bearing surface reclaimed in position. Within 30 hours of discovery of the lower bearing surface problem, it had been resurfaced and the bearing change recommenced. Cost: Savings were huge. The sheer speed of operation slashed costs across the board. The Pakka Jacks system allowed the bearing surface reclamation in situ, dramatically reducing the project time. The final drive shaft had snapped in two and had bent the drive transmission mounts on the track frame. The machine was located at the bottom of the mine area and couldn’t be moved. A customized jacking pad was prepared and the 893 ton machine raised. Customized side frame removal rails were set up and the damaged side frame was sent away for repairs. 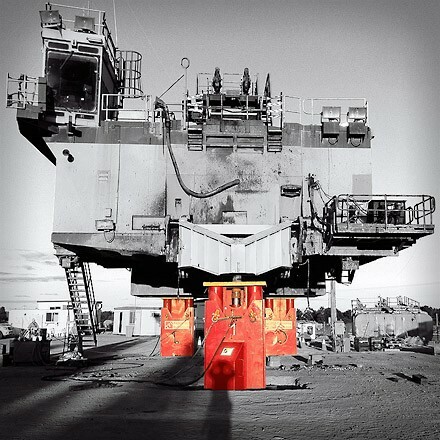 Mine supplied fitters were able to use the downtime to safely carry out much needed maintenance on various components, an extraordinary benefit of the Pakka Jacks system. The refurbished track frame was transported back to the site and fitted. Cost: Savings were huge. The ability to perform additional maintenance work added enormous value. The versatility of the lifting system meant that the work could proceed in situ. The additional maintenance was also an enormous cost saving. Inspections on the slew bearing indicated that deflection was increasing rapidly and the machine was stood down. A team of 4 Pakka Jacks technicians was deployed with the equipment, arriving on site 24 hours after the phone call. After mandatory inductions, the job was completed in four 12 hour shifts, only 70 hours from the decision to stand it down. Cost: Savings were huge. Craneage costs alone were slashed. The streamlined workflow got the RH340 back to work in only 70 hours. The rope shovel needed de-decking to perform a major outage lasting 6 weeks. The process required the car-body to be walked out from under the upper deck, leaving the deck lifted at a set height for the duration of the outage. Improved safety: No need for over 70 inches of packing plates around the machine. Cost: Savings were huge. The Pakka Jacks system meant that the lifting system also fully supported the load at every stage of the lift. The fact that the lift units were also the certified stands for the duration of the project, meant that set-up and commissioning times were slashed. The BHP Billiton owned Liebherr digger required a number of significant change-outs and repairs. The Pakka Jacks system allowed all work to be carried out simultaneously. The entire machine was raised 23 inches, additional stands were placed under the car body to allow for side frame removal, which also made it possible for all phases of the outage to proceed simultaneously. Allowing multiple jobs to proceed at once, safely, meant that a large and complex project was completed in less than half the time.